Debika Shome served as the Deputy Director at the Harmony Institute, a research center that measures the impact and influence that entertainment can have on social and environmental issues. The Harmony Institute believes that mainstream media, combined with the power of strong storytelling, can be instrumental in producing lasting social change. 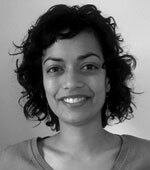 Debika joined the Harmony Institute from Columbia University’s Center for Research on Environmental Decisions (CRED) where she served as Assistant Director from 2005 to 2009. In addition to her work conducting and coordinating research at the center, Debika led CRED’s outreach and public policy initiatives. She is the co-author of The Psychology of Climate Change Communication, released November 2009. In addition, Debika has over a decade of experience that includes work in the public, private, government, and non-profit sectors. She has consulted on a diverse range of issues, including environmental best practices, corporate social responsibility, technology innovation and sustainability. She has worked for organizations such as B Corporation, the US Geologic Survey, the Nonprofit Technology Leadership Program, and Environmental Defense Fund. Debika completed her Master’s in Public Administration from the University of Washington. She holds an undergraduate degree from Barnard College.